If you're working with data that's been added to an Excel data model, then sometimes, you may lose track of which tables and data sources were added to the data model. Note: Make sure you have enabled the Power Pivot add-in. For more information, see Start the Power Pivot add-in for Excel. In Excel, click Power Pivot > Manage to open the Power Pivot window. View the tabs in the Power Pivot window. Each tab contains a table in your model. Columns in each table appear as fields in a PivotTable Field List. Any column that is grayed-out has been hidden from client applications. 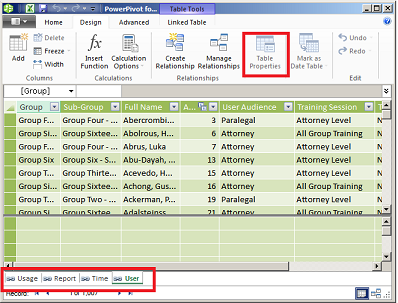 To view the origin of the table, click Table Properties. If Table Properties is grayed out and the tab contains a link icon indicating a linked table, the data originates from a sheet in the workbook rather than an external data source. In Excel, click Data > Connections. Select the connection used to populate the table in your model. Click Properties > Definition to view the connection string. Note: Data models were introduced in Excel 2013. You use them to create PivotTables, PivotCharts, and Power View reports that visualize data from multiple tables. Learn more about data models in Create a Data Model in Excel.